Found one file extension association related to RuneScape Daemon and 1 file format developed specifically for use with RuneScape Daemon. RuneScape Demon (RSDemon) is a versatile and regularly updated toolkit whose main purpose is making playing RuneScape more enjoyable. 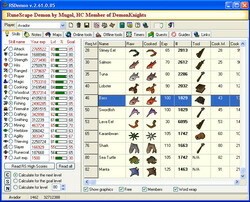 RSDemon contains innovative dynamic skills calculators, progress graphs, RSDraco - the RuneScape client, complex treasure trails - clues - solution center (with hundreds of sample rewards), coordinates locator, great maps (including the best available classic Wilderness map), unlimited notepads, players and servers peering, countdowns and timers, screen and window grabbing, user images, combat calculator, numerous skill guides and quests walkthroughs, IRC Chat clients, and many many more features. If you need more information please contact the developers of RuneScape Daemon (Andrew Gower and Jagex), or check out their product website.